A modern car is immobilized without a working generator. Drive to the garage or service does not always work. The conclusion: avoid breakage of the generator. The generator is quite reliable and rarely goes down. If you do not go into technical details, the device is as follows: the most common three-phase alternating-current generator consists of a stator (the casing is fixed inside the coil) and rotating inside the rotor. Battery current is supplied to the rotor winding of the generator and creates a magnetic field. For supplying current to the rotor is designed with the collector brushes. Given that the entire car's electrical system is direct current, the generator is built into the body of the rectifier. During THE generator check the voltage at the terminals of the generator and the condition of the drive belt. For overload protection in the electrical system of the car is transistorised relay-regulator, often mounted on the body of the generator. Often used hinged generator installed outside the power unit and the driven belt. This is the most convenient in maintenance and repair of the form of the generator. Work generator check lamp the battery (on the dashboard). The normal generator and an electrical system of a car this light should be illuminated along with other indicators at ignition on, and off immediately after starting of the engine. Any other behavior of this indicator signals the presence of faults. Among these faults may be: discharged battery, break the circuit breaker contact to ground, the burning of the fuse or the lamp, failure of the generator. The generator may be a poor contact commutator brushes or breakage relay-regulator. If the control indicator the battery is switched on and off, in addition to these faults can be: loosening or breakage of the drive belt of the generator or failure of the rectifier unit. The latter may be accompanied by failure of the relay-regulator. For a more thorough check of operation of the generator please refer to the technical station, which has a special stand for testing of generator. If the car has significant mileage, wear of rotor bearings. This leads to poor contact of the brushes. The test lamp will turn on and constantly work with the weak flashing. Blinking charging indicator battery may indicate different faults. With small defects can go a long time without significant consequences. A fault, e.g., the relay-regulator can cause a short circuit in the generator and its subsequent replacement. To determine the cause of failure in traffic conditions is quite difficult. In most cases this can be done by loss of battery capacity. On older cars more opportunities for fault detection provided installed voltmeters. For modern cars only one solution – go for a HUNDRED until I finally got the battery. Check all circuits of a modern car can only be a HUNDRED. To repair the generator difficult. Unable to tighten the nuts, tighten or replace drive belt, dry contacts. Do not change by yourself the generator, the cause may not be in it. Exception: the worn-out generator (defined by a specific noise). When the need arose to repair the generator on the road, disconnect it, remove and disassemble. A frayed coil wire connect the stripped ends and tape. Subsequently, the coil be sure to replace. If swallowed, generator, dirt, or oil, remove the brushes and rinse them in gasoline. Then dry. Collector treat fine sandpaper, then wipe clean. When removing the wires from the battery when the engine is running can damage the alternator and all on-Board electronics. Generator is a basic device, without which the car will not go far. Its performance is affected by a number of factors. If the generator stopped working, find out the reasons of failure and try to fix it on their own. The most common cause of generator failure is the lack of excitement. To test the generator, you need to make it to the positive terminal of the battery at 1000 rpm of the engine. Before it is necessary to give the load (turn on lights), otherwise failure may leave the switch and other electronics. If the engine stalls the alternator is not working. The first thing to check was broken if the alternator belt. If the belt is intact, it is likely that he was weaker. Check the belt tension: deflection under force of 10 kgf should be not more than 1 cm belt, may be splattered with oil and slip. In this situation, it needs to be replaced, or at least to wipe with gasoline.If the seat belt is tight, clean and not torn, then check the fuses of the field winding. It is usually sufficient simply to move, and then it will work. This is especially true of domestic classics (VAZ-2105, 2106, 2107), which is mounted fuse is weak. If after the performed operation the generator still does not work, then remove the generator. First, inspect brushes for wear – perhaps they need to be replaced. You should also pay attention to the slip rings. If they are dirty, clean them. Now re-check the generator for proper operation. If he does not submit signs of life, arm yourself with tester and check the chain.After all done operations be only two reasons. Either a faulty voltage regulator or the generator. The generator often burn up the rectifier diodes. Each diode should "ping" tester, and if it turns out to be faulty, replace. If all diodes are intact, check the stator winding. This is done with a simple tester, closing them both ends of the winding. If the stator windings are faulty, it can be replaced. However, the stores can get damaged stators, as they are checked in the same way. The lamp with a picture of a battery on the dashboard. Don't hit the panic, because the majority of the fault lies on the surface. To eliminate it, will not even need to remove the generator. - a set of keys and screwdrivers. Look at the pilot light located on the instrument panel. Its mode of operation is such that when the ignition is on it turns on but with the engine running it goes out. If it continues to burn after engine start, the battery charging is missing. Use a multimeter to check the voltage, it should not be less than 12 Volts. The cause of the tanning lamps can be as belt breakage, and in violation of the transaction. If a lamp burns in polygala, then there is a weak belt tension. In this case, it is necessary only to tighten to the required state. Check fuse F2, if the belt is tensioned, but the voltage is below the position. If blown, then replace it, then check the charge on the battery. If the fuse is good, or after replacement, no change has occurred, and the system voltage remains low, you will need at terminal 61 to measure the voltage. Its value should be about 6 Volts. If no voltage, then remove the dashboard and look for fault in the soldering in the resistance, it is also possible that simply broke the wire going to the dash from the 61 conclusion. Remove the relay-regulator if voltage is there, but it is more than 6 Volts. Check it with a test lamp. You need to file for a relay-voltage regulator 12 Volts. Plus submit at the plug connector of the controller, and minus on the case. A test lamp designed for 12 Volts, output up to 3 Watt, connect to the brushes of the regulator. At a supply voltage of 12 Volt test lamp will light. Boost the voltage up to 16 Volts. The lamp should go out. If not, then faulty relay-regulator. 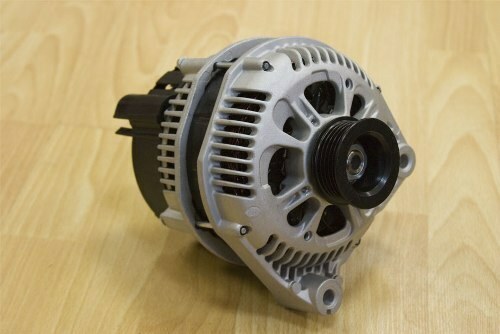 But if he's serviceable, and charging not, you will have to remove the alternator and look for damage in it. Use a multimeter to check the rotor winding of the generator. The excitation winding should have a resistance of 4.5 Ohms. If it is less, then the entire fault lies in her. Replace the armature or rewind the coil. It is possible that the contamination occurred slip rings. Clean them, wash them with solvent or replace. If still the multimeter shows that the rotor winding open circuit, replace the rotor. But if the rotor winding is all right, check that there is no short between the 30 terminal of the generator and the housing. If so, you need to get rid of it. Make diagnosis unit of the rectifier, if there is no circuit between ground 30 and the output of the generator. For this you need to check each diode in the presence of breakdown. The semiconductor conducts electric current in only one direction, in this property, and checks diodes. If burned down a few diodes and it is impossible to eliminate breakage in the rectifier unit, replace it completely. 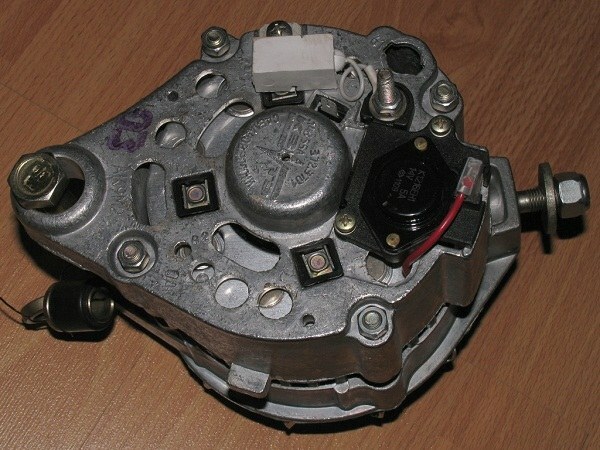 But if the block is OK, check the stator winding for short-circuit and breakage.